Powerful and easy to use fumers as used by professionals. You just light the fuse and close the door behind you. Effective control of flying and crawling insects in hard to reach places. 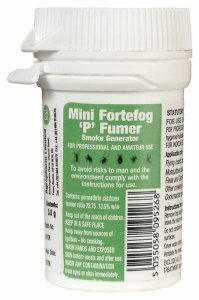 ForteFog Fumers are effective for control of: fleas, flea larvae, house dust mites, ticks, bed bugs, ants, wasps, cockroaches, cluster flies, house flies, mill moths, carpet beetles, silverfish, grain weevils, fruit flies, mosquitoes, indian meal moths, confused flour beetles and many other pests. Mini Fumer: ideal for small rooms and greenhouses - treats up to 120 cubic metres. Midi Fumer: treats up to 400 cubic metres. Maxi Fumer: treats up to 1000 cubic metres. Jumbo Fumer: treats up to 4000 cubic metres.